“No matter how black a cow is, the milk is always white”, as the old saying goes. Milk is counted among the most essential staple foods, is an important part of a balanced diet and contains, among other vital nutrients, a high percentage of calcium. In 2017, worldwide milk production amounted to about 501.03 million metric tons. Among the major producers, the United States was ranked second with a milk production amounting to over 97.84 million metric tons in 2017. California and Wisconsin represent the most important milk producing states in the U.S. milk market. Combined they accounted for a production volume of about 70 billion pounds of milk in 2017. Wisconsin is also known as “America’s Dairyland”, whereas California advertises with the slogan “Happy cows come from California”. Nestlé USA, Dean Foods and Saputo Inc. constitute key market players in the competitive retail sector. U.S. milk retail sales amounted to 45.48 billion pounds in 2017. Within the category, reduced fat milk (2%) took the lion's share of retail sales. On the consumer side, a recent survey revealed that 58 percent of Americans use milk and dairy as a high quality protein source. Nevertheless, per capita consumption is projected to decline significantly from 194.9 pounds in 2010 to 155.1 pounds by 2027. 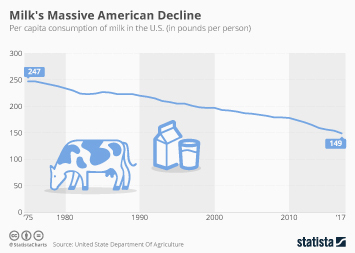 Contrary to the decline, premium-priced milk categories such as organic, plant-based or flavored products should assist in increasing American consumption once again. Milk retail sales in the U.S.